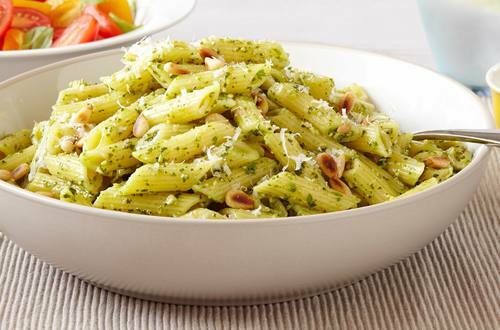 Creamy pesto pasta salad with toasted pine nuts, parmesan and Hellmann's® or Best Foods® Real Mayonnaise. Perfect for a quick, light lunch. 1 Cook penne according to package directions. Drain and rinse with cold water until completely cool. 2 Combine cooked pasta, basil pesto, Hellmann's® or Best Foods® Real Mayonnaise, lemon juice and black pepper in medium bowl. Garnish with cheese and pine nuts.